Next pie chart shows the strength of the price of the stocks. 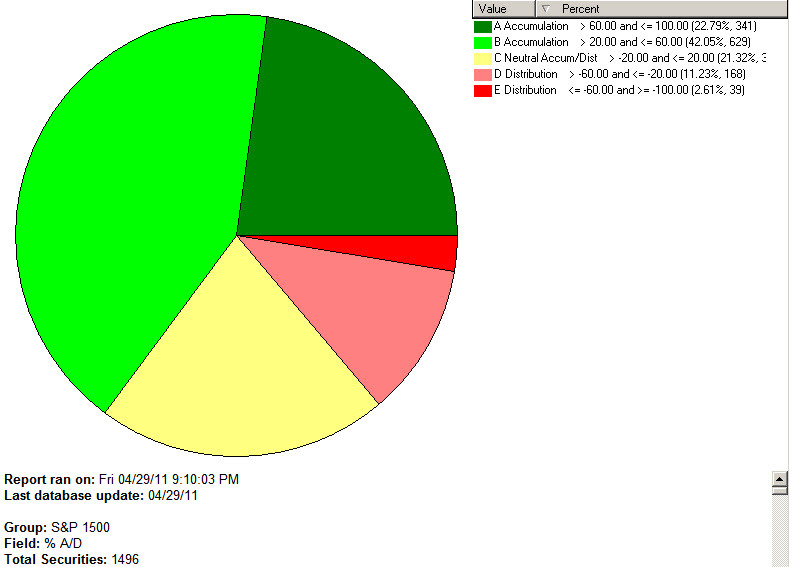 The pie chart is divided into “slices” or “buckets”. Each slice shows the number and percentage of stock prices in relation to their Bollinger Bands. Way above the upper band is very strong, above the mid-point moving average is pretty good and below gets worse. 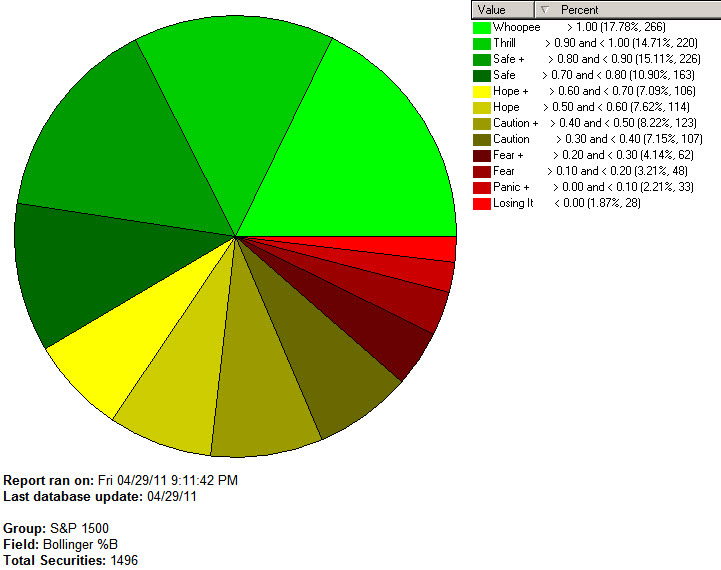 I think you get the point; dark green is real strong, yellow is neutral, while the reds are weak. Now, while the market is showing definite signs of strength, I should note that there appears to be some signs of sector rotation. Sectors that look strong now are: Heath & Bio Science, Auto Parts, Internet, Semiconductor Mfg., Cable & Wireless, Drug – Pharma, Chemical, select European and Asian-Pacific Rim countries and Steel. It seems that there may be a rotation away from some Retail and Tech names. So keep an eye open for signs of money changing sectors. Other than that, I’ve sold Silver on friday. No big technical reason except I’ve done well with it, and the daily volume speaks of a bubble to me. Way tooo many people (likely retail investors) are chasing it now. And once the last person buys it, it WILL go down. I certainly don’t know when that will be, but it will likely be a violate move. No thanks. Have a good weekend and an even better week. Cheers ! Chart courtesy of High Growth Stock Investor (www.highgrowtstock.com), (C) 2000-2011, used by permission.